DIY Days, organized by Lance Weiler and Arin Crumley, are coming to Boston this weekend. Friday is a screening of films from the 'From Here to Awesome' festival, and Saturday is a day-long conference on the new world of filmmaking, distribution, and marketing. Here's a short piece of mine from Variety this morning: TiVo functionality is coming to the PC, for $199. The Nero LiquidTV/TiVo PC is a $199 package of hardware and software that will enable a PC user to watch cable, satellite, or digital broadcast content, pause it while it’s playing, or record it for later viewing. "This is the TiVo experience without the need for a set-top box," said Richard Carriere, president of Nero AG Americas. "This is acknowledging the fact that mainstream consumers are ready to enjoy their media in a very fluid manner — any time, on any device." I do note, though, that watching live TV on PCs, while it has been possible for a while, hasn't yet taken off with the mainstream. What do you think of this seminar on Internet marketing for filmmakers, being offered in LA next month? "Discover The SECRETS of Selling Your Film Online!" they promise. "Build a HUGE List of Loyal Fans. Create a Website That Motivates People to BUY YOUR FILM. KEEP THE MONEY YOU MAKE While Maintaining Creative Control. Leverage the Power of 'Joint Venture Partners' to Sell THOUSANDS of Copies of Your Film." Sounds like the right stuff to be doing... but I'd not heard of Marc Rosenbush before, or his one movie, 'Zen Noir,' which won awards at the Rhode Island Independent Film Festival and the DC Independent Film Festival in 2004. This is the first time he has offered the seminar. It costs $997. I promise this won't turn into Le Blog De Perpetual Self-Promotion, but just a quick link to something that was fun to do: the New York Times' weekly "Tech Talk" podcast (MP3 link). Show notes here. Also up is a list of the some of the folks who've signed up to be there. And an ad for the event (at right) appears in this week's national edition of Variety. In BusinessWeek: "Innovation Lessons from Hollywood"
BusinessWeek Online ran a piece this week related to Inventing the Movies, titled "Innovation Lessons from Hollywood." Ever since Thomas Edison and Kodak founder George Eastman helped invent the movie industry in the 19th century, the people who populate it have tended to give the cold shoulder to every new tool, technology, or business model that comes along. From sound to color, television to home video, computer animation to the Internet, each new idea has been dubbed too expensive, too unreliable, just a fad, or a threat to existing business models. And yet if Hollywood hadn't eventually embraced each of these innovations, it's unlikely that the business would have survived. Hollywood, it turns out, isn't so different from every other successful, established industry—from health care to financial services to auto manufacturing. Amazing amounts of energy are spent fighting ideas with the potential to expand the business and enable it to survive. Along with it was a list of "18 People Who Changed Hollywood." One of the big questions on the mind of filmmakers at the IFP Filmmaker Conference this week was, is Internet distribution working for anybody? How much money is there to be made? Yes, it's still the early days for all things digital -- but given that the traditional distribution marketplace is in such disarray, people are eager to understand their alternatives. 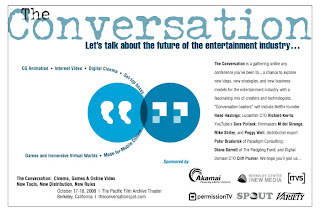 One of the featured speakers, on Wednesday, was Rick Allen, CEO of SnagFilms (which I wrote about here, back in June). Allen shared some of the numbers from SnagFilms' first two months of operation. They now have 440 films in the library...and viewers have consumed two million minutes of content online. About 10,000 people have installed the SnagFilms widget, which lets them select movies to "embed" or integrate into their own site. Allen said that by the end of the year, the process of submitting a film will be much easier for individual filmmakers. 1. How much are the most successful filmmakers earning from advertising? (Snag shows short ads during the streaming of movies, and splits revenues 50/50 with filmmakers.) Allen was asked this during his session, but he said they didn't have enough data yet. 2. ...Which means that the real way filmmakers will make money through Snag is by selling DVDs. I asked Allen after his session whether he could share any stats about the percentage of viewers who decide to buy the DVD. (There, Snag takes an 8.5 percent cut of the transaction, but lets the filmmaker keep the rest.) He said it was too early to tell, but that anecdotally, filmmakers he has spoken to have seen an uptick. I'm at the IFP Filmmaker Conference today (or actually, I'm at an Apple Store in the meatpacking district because there's no WiFi in the conference venue)...and just finished with my late-morning Conversation with Robert Greenwald. - Greenwald emphasized the importance of having a good title. (One of his early made-for-TV movies was 'Flatbed Annie & Sweetiepie: Lady Truckers.') In today's world, when you often e-mail people about your latest film or online video, having an attention-getting subject line is equally important, he said. - He talked about how he has been leveraging his team of volunteer "field producers" -- about 2,000 people around the world-- to help research his films, take still photos, shoot B-roll, and conduct interviews. This began with 'Uncovered' and has continued with his Internet video series about John McCain. - Lately, he has shifted his focus to cranking out short videos for online consumption... most of them hosted on YouTube. It's important to hook viewers in the first five or ten seconds, he said, but there's no rulebook on how to do this. Greenwald says you don't have to be gratuitous -- naked women are not required -- and in fact being serious, and talking about issues that no one else is talking about, can be powerful. - Greenwald initially relied on a mailing list run by MoveOn.org to connect with progressive, issues-oriented voters who might be interested in his movies. But he quickly discovered the importance of building his own mailing list. - He said that someone passing along a video to a friend and saying, 'Watch this,' is the most powerful endorsement you can get -- and a near-guarantee that the recipient will watch. - Just making a video and putting it on YouTube doesn't get you much action. Greenwald says he has a team of four people at his production company doing outreach and publicizing his videos, both to traditional TV and print media and also to bloggers. I was amazed at the number of people in the audience who stood up at the mics to simply thank Greenwald for his work -- or volunteer to help him. Peter Broderick has written a great piece called "Welcome to the New World of Distribution." What's important is that it urges filmmakers who believe that traditional distribution is broken -- and are finding it hard to figure out how they'll earn a return -- to try something different. The new world can be dangerous, and there aren't safe routes to success. "But for all the obstacles and dangers," Broderick writes, "there are unparalleled opportunities." One of the best: controlling your own destiny. The chart at right is from Broderick's piece. While filmmakers and studios would like that logic to be true, since DVDs offer plusher profit margins than downloads, it just isn't. TV was a tiny business when it started -- so tiny that it couldn't afford to pay enough money for the rights to air Hollywood movies... so Hollywood studios dismissed the medium and refused to sell to it. Home video was a tiny business when it started -- literally, one guy in Detroit (Andre Blay) asking the studios for the rights to sell their movies on Betamax and VHS. It eventually got bigger. Patterns like this tend to repeat. Online sales and rentals of movies and TV shows today represent 0.5 percent of American consumer spending on movies and television, according to NPD Group. Tiny. But it'll change. The FilmInFocus Web site, run by Focus Features, has an exclusive out-take from Inventing the Movies -- essentially a short chapter about the role that the Sundance Film Festival plays in testing and promoting new technologies. For ten days every January, Park City, Utah becomes a microcosm of the independent film world: there are ambitious young filmmakers vying to get their movies noticed, passionate cinephiles debating what’s worth seeing, and acquisitions executives looking to pick up the next 'Napoleon Dynamite' on the cheap, for eventual nationwide release. The Sundance Film Festival wasn’t explicitly intended to promote the marriage of indie filmmaking and new technologies, but for more than two decades, since Robert Redford’s Sundance Institute took over an event that had been born as the Utah/US Film Festival, it has done more than any other festival to make that marriage happen. The TechCrunch 50 conference in San Francisco this week featured a panel on the relationship between Silicon Valley and Hollywood. Speakers included director Joss Whedon, Michael Yanover from CAA, Chris Henchy from FunnyOrDie, and Stan Rogow of Gemini Division. The excitement that’s being generated right now really exists between the creative people and the public. As far as Hollywood, the great giant studios, I think they’re just trying to figure it out. They come to it with this great enthusiasm, how can we use this to not pay people, and how can we control all of it. There’s a huge bifurcation between what made YouTube and Funny or Die, and what people in studios are doing trying to create a successful television show where you pour in millions and you get back millions. Variety was nice enough to run an excerpt from my new book Inventing the Movies this week. It deals with some of the early interactions between Pixar and Disney. They also ran some "exclusive" content -- a list of several of the worst predictions ever about the future of the movies. Also: If you live in the San Francisco area, I'll be giving a (free) public talk about the book on October 19th in Berkeley, at the Hillside Club. More info about that and other events is here. Interesting in the future of filmmaking? On Sept. 25th, I'm moderating a panel in Cambridge, Mass. that'll touch on what's next for visual effects, editing & post-production, and digital distribution of movies. This is an evening networking event in the heart of Kendall Square, accessible by T. The goal is to bring together Boston-area filmmakers and techies. We've got folks on the panel from Avid Technology, Brickyard VFX, and EZTakes; legendary VFX artist Jeff Kleiser (he has worked on movies like 'Tron' and ' X Men'); and Katherine Hays, the new CEO at GenArts. There will be clips shown, lots of time for questions, and snacks! I'm going to open things up by giving a short presentation on the role that Massachusetts companies have played in the evolution of the movie industry. Best news of all is that there is now a special rate for students and filmmakers: $20. You can register here. I love this idea: let audiences pick what plays at their local theater. ...MovieMobz goes a social step further. Its website allows filmgoers from the MovieMobz.com film club, to "mobilize" by choosing films, both classics and new releases, and click on a "I Want to See It" button. Once enough viewers vote on a film, it emails members with screening details. So far, MovieMobz has attracted 4,000 members and staged 20 film sessions, MovieMobz CEO Fabio Lima says. About 2.5 people attend for every member who's voted. "People bring their friends. Newspapers highlight sessions. Our entry prices are always lower than the half-price tickets students get," Lima says. Why doesn't someone in the US give this a shot? One interesting twist on the idea would be to let voters put their money where their mouth is: what if a voter agrees to give the theater her credit card number when she votes... and if the movie that she votes for eventually plays, her credit card is charged $5, and she has essentially bought an advance discount ticket. That seems like a good way to encourage people to show up to the theater ... not just to vote online. It's not too unlike the way Priceline gets you to guarantee that you'll pay for a hotel room you've bid on. Everyone has a few movies that drive them crazy... 'cause they're not available anywhere as DVDs or in downloadable form. For me, one of those movies has been 'Cinerama Adventure,' which tells the story of the panoramic projection technology that swept America in the 1950s and 1960s. (It died out in the mid-1960s...) I'm obviously a fan of movie history, especially where it intersects with cool technologies -- and yet I missed the few theatrical screenings this documentary had in 2003. YouTube has a few cool clips from the making of the documentary. The best online history of Cinerama can be found at the American Widescreen Museum. Can we all concur that the business model for making and distributing independent films is in flux? I’d like to humbly suggest that film festivals need to play a different, more muscular role in helping filmmakers earn money from their creative endeavors. The model today, for filmmakers lucky enough to win a slot at high-profile festivals like Toronto, where acquisitions execs are prowling, is to hustle and hope for a distribution deal –- before, during, or after their festival run. And yet we know that the majority of films – even those that win entrance to Toronto, Tribeca, or Sundance -- don’t ever get that deal. For most movies, playing at a festival (or two or three) is the most attention their film will ever get from the media, movie lovers, agents, and yes, potential distributors. I acknowledge that some filmmakers will choose to continue playing “festival roulette”: spin the wheel and hope for a deal. But I think smart filmmakers ought to consider using the highest-profile festival they can get into as the platform for launching their movie. During the festival, or on the day it ends, they should make their movie available through their own Web site, perhaps using DVD-on-demand services like NeoFlix, Film Baby, or CreateSpace/Amazon. Same thing for making downloads available: get that movie onto Amazon Unbox, B-Side, or iArthouse. And I think festivals ought to do more to create opportunities for their filmmakers: a deal with iTunes, for instance, which puts movies into that popular marketplace (iTunes is notoriously difficult for individual filmmakers to work with), or a broadcast deal with a cable channel or pay-per-view service to put the movies on TV, plastered with festival branding, which would serve as a “Good Housekeeping Seal of Approval” for movies that might not have stars or high production values. From a festival perspective, I understand the fear that allowing movies to be sold online during the run of the festival might diminish that “I saw it first” feeling that festival audiences enjoy. They might prefer for distribution to begin only at the end of the festival. But if the DVD or download featured the festival logo as part of the opening credits, that could also serve as additional marketing for the fest. So...wouldn’t distributing a movie during, or just after, it plays a festival totally torpedo any chance for distribution? For some old-school distributors, yes. But the more forward-thinking distributors might look at strong sales of downloads or DVDs in the weeks following a festival as an indication of viewers’ interest in the movie. They might appreciate a filmmaker who has been collecting e-mails and ZIP codes of everyone who has purchased her film, since that data can be used to pick the perfect cities for a theatrical run, and to promote that run. I spoke earlier this week to a Sundance spokesperson, who said that nothing prohibits a filmmaker from selling his movie online during the festival, “although we wouldn’t recommend it.” She said no filmmaker had yet tried it, to her knowledge. “We know certain festivals where it’s clear they discourage distribution during the festival, but I think that even those festivals aren’t going to discourage it for long,” says David Straus, CEO of Withoutabox, which helps festivals run their submission processes, and is increasingly getting into the distribution business. “I think festivals see that it’s important that filmmakers really have the ability to start monetizing their film at the festival, and they can be the catalyst to help them do that,” Straus adds. Of course, I could be totally wrong, and this could be a dead end. Some people believe that films that don’t get picked up for distribution at festivals are completely worthless, and that nobody wants to see them. (I don’t.) Some people believe that things never change, and that distributors will forever give the cold shoulder to filmmakers that pursue the kind of self-distribution strategy I’m proposing, to make the most of their festival buzz. Some people may feel that it isn’t part of a film festival’s mission to help filmmakers make a living. And some people –- the real pessimists –- may believe that there will never be a new business model for independent film. Will Movie-Goers Pay $35 a Ticket? The LA Times covers Village Roadshow, which is opening three ultra-luxe theaters in Southern California in 2009. Think the ArcLight's swank? It's a grindhouse compared to this, baby. The Gold Class experience starts with online seating selection, valet parking and a concierge desk at check-in. Auditoriums will be the regular size but hold 30 to 40 table-side seats each, as opposed to 150 to 200 seats with drink holders at a typical multiplex, said Rob Goldberg, chief operating officer of Village Roadshow's Burbank-based Gold Class Cinemas division. With the extra room, black-uniformed, "stealth-like" servers will be able to whisk menu choices such as lobster spring rolls, duck tacos, Wagyu beef burgers and creme brulee to customers' tables without obscuring the movie, he said, all at the call of a button. The theaters will offer seasonal menus with more than 100 wine selections, plus signature cocktails. Two other Gold Class locations, in Illinois and the Seattle area, will open later this year. Here's the site for their Australian locations, and here's a Variety story from earlier this year. Clearly, they're not targeting teens who might see a movie a week during the summer... but adults for whom movie night might happen every other month. Innovation in the exhibition business? I'm all for it! - The New York Times ran a story Sunday and another this morning about original Web video content. The message of both, when read together, is that there hasn't yet been a 'Seinfeld'-like hit on the Web yet, but lots of people are trying. ...[P]roducing Web content may be easy but profiting from it is hard. While a small number of writers, producers and actors are making a living with webisodes, they are still a long way from establishing the form alongside television and feature films. The newfound industry lacks clear business models and standardized formats. And so far, it also lacks audiences. Ask most average media consumers what Web shows they watch, and the reaction is likely to be a blank stare. If they have heard of webisodes at all, it is probably in the context of “Quarterlife,” a Web series that leapt to TV and flopped spectacularly in the ratings in February, or “Prom Queen,” an online drama backed by Michael Eisner, the former chief of Walt Disney. ...[P]erhaps because of the cost of hiring a known actress like Ms. Dawson, the execution is lacking. The actors are pasted on top of static photo images of hotel rooms and Paris landmarks, and very little animation has been done beyond the annoying use of graphics to indicate that we’re actually watching video transmissions from Ms. Dawson to a friend back home. It’s like watching “Sin City” or “300” without the digital effects, which — need I say? — were just about the only reasons to watch those movies. So what do you think, will the hits come from the big guys, or the independents? Someone from Gen247 Media e-mailed me last week to point me to 'Deleted: The Game', a "Web TV show that promises to blur the lines between fantasy and reality by drawing viewers into an interactive game." Their budget is "next to nothing," I'm told, and they shoot act-by-act, which allows them to incorporate audience input. Characters are available for viewer interaction on sites like MySpace, Facebook, or via chat. Viewers can win prizes, or a chance to do a cameo on the show. The independent-theater owners "want to remain competitive, and they want to accrue the benefits" that come with 3D, said Michael Lewis, chairman and chief executive of RealD. ...Theaters tend to charge a premium for 3D tickets, often $2 to $5 more than regular tickets. That means movies that run on 3D screens can boost theaters' and studios' bottom lines. During opening weekend for this summer's "Journey to the Center of the Earth," 3D screens took in almost four times the revenue of 2D screens showing the movie. Nick Dager edits one of the most respected sites that focuses on digital cinema, Digital Cinema Report. The September "edition" of the site includes a new excerpt from Inventing the Movies, which I adapted especially for Nick's site. It covers the many false starts of the digital cinema revolution...from predictions in the 1940s and 1950s that digital cinema was right around the corner... to efforts by Pacific Bell, George Lucas, and Texas Instruments in the late 1990s...to the present day, when we still haven't hit the digital cinema "tipping point." When did the digital cinema revolution begin, and who started it? A handful of Hollywood soothsayers were predicting the imminent arrival of digital cinema in the middle of the 20th century. In 1949, the independent producer Samuel Goldwyn, who’d helped to launch three Hollywood studios (Paramount, MGM, and United Artists), anticipated the development of video-on-demand systems that would allow movie fans to view the movies they wanted to see at home, as well as methods for delivering a movie electronically to thousands of theaters, saving the studios the cost of making film prints. A few years later, in 1954, Albert Abramson, a CBS television engineer, published an article titled, “A Motion-Picture Studio of 1968.” In it, he sketched out how digital cinematography and a film-free distribution system would work: movies would be shot with electronic cameras, and then “sent by radio-relay or coaxial cable to the theaters. Five or fifty theaters in an area may be receiving the same program. An area may cover the whole state, a county, or just a large city. But no theater is shipped the actual picture tape.” Abramson also expected that by 1968, a new generation of electronic cameras would be totally self-contained and cordless – capable of capturing 3-D imagery and transmitting it wirelessly back to the production center.